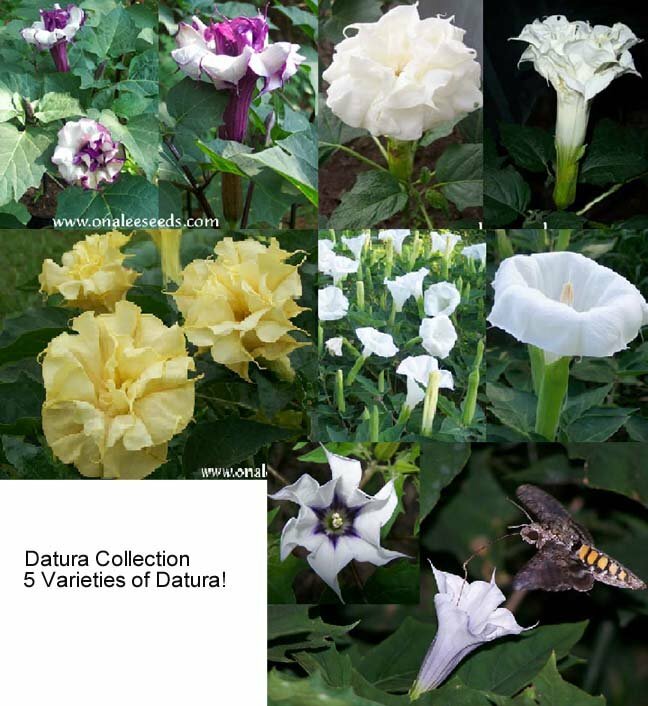 FIVE varieties of Datura / Devil's Trumpet seeds for the price of FOUR! 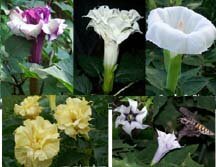 Get your Datura Garden going fast with this collection of 5 varieties of flowers: Double Purple, Triple Yellow, Triple White, La Fleur Lilac and Large Single Moonflower Datura. The plants/seeds/blooms are poisonous if ingested. I've even had some TRIPLE blooms this year from these plants! These datura (Devils Trumpet) have fragrant, double purple and white trumpet shaped blooms about 8 long that face upward. . If the flowers weren't enough, the plants also sport glossy, dark purple stems and reach 3 feet tall. This continues to be one of the most popular flowers with my customers and me! These fast growing Datura (Devil's Trumpet) have fragrant, triple, creamy-yellow trumpet shaped blooms about 8 inches long that face upward and attract hummingbirds and sphynix moths as well as butterflies. Another favorite!! These fast growing Datura (Devil's Trumpet) have fragrant, triple, pure white trumpet shaped blooms about 10 inches long that face upward and attract hummingbirds and sphynix moths as well as butterflies. 24+ Datura Tatula / LaFleur Lilac (Datura stramonium var. tatula f. tatula Datura chalybea) seeds. (Other common names: Jimson Weed, Horn of Plenty, Devil's Trumpet, Thorn Apple). 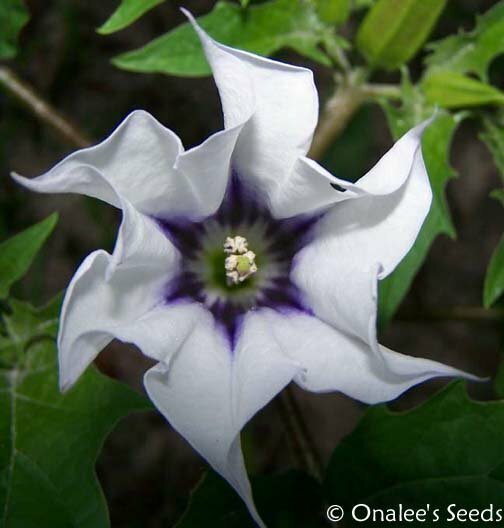 These fast growing Datura have single, white, trumpet shaped blooms with lilac/purple highlights in the center. Blooms are about 3-4 inches long and face upwards, attracting hummingbirds and sphinx moths as well as butterflies. They open in the evening or on cloudy days. The tightly scrolled flowers are short lived but are produced in a regular and abundant procession. 24+ SINGLE, LARGE, WHITE MOONFLOWER DEVIL'S TRUMPET (Datura inoxia) SEEDS Other common names are: Hindu Datura, Indian Apple, Sacred Datura, Thorn Apple. These have VERY fragrant, large (8-10 inches) white trumpet shaped blooms that face upward opening in the evening and staying open until the sun fades them the next day. PERFECT for a NIGHT GARDEN! Planted in a group, these flowers are very IMPRESSIVE with their huge, pure white blooms facing the heavens each night! 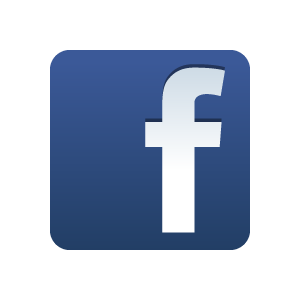 Each plant will grow to a height of 4 feet and a width of 3feet and will have multiple blooms at any given time and bloom continuously throughout the summer.